So goes the opening to the Ming dynasty novel Romance of the Three Kingdoms. It’s about the inevitability of war and the promise of peace. It also speaks to the instructive power of the war novel. Three Kingdoms is part history, part mythology, and part philosophical reflection. It covers the exploits of the heroes and villains following the collapse of the Han dynasty. Its author Luo Guangzhong drew from historical accounts and local folklore, from the scrolls of the universities to the oral tales and songs spun by erhu-playing beggars in the markets. It is also a reassertion of Han Chinese values, and the novel’s plot serves as a platform for Confucian ideals. In the world of the novel, principled men get killed trying to do the right thing, eunuchs exert their power with whispers between silken tapestries, and a distant scion of an imperial family seeks to press his claim despite long odds and the challenges of geography. With its 120 chapters and close to a thousand characters, Three Kingdoms was Game of Thrones in a time when Europeans were painting themselves blue and practicing human sacrifice. Three Kingdoms’ influence in East Asian culture promotes the theme that the more we understand war, the more we understand ourselves. Many proverbs or concepts in East Asian culture can be traced back to the novel or its characters. Its historicism is allegorical; it contains truths the way the Torah contains truths. It conveys the universal rather than the documentary. Many of the novel’s set pieces, too, are recognizable to people all over Asia: the empty castle stratagem, the fiery conclusion of the battle of Chi Bi, the putting down of the Yellow Scarves Rebellion. A wayward son may be reminded that wives are like clothing, and brothers are like limbs; you can remove the former but not the latter without great risk to yourself. A man who is said to be Machiavellian and paranoid was called a Cao Cao, after a character in the novel (the “C” makes a “ts” sound). This guy was Darrell Issa before Issa was Issa. As much as I love Three Kingdoms, this is not about the novel. This is an admission of failure. I have been teaching a war novel for years and I’m still at a loss on how to do it right. The French doctor René Leriche was quoted saying, “Every surgeon carries within himself a small cemetery, where from time to time he goes to pray.” Teaching isn’t surgery; it isn’t as challenging, nor are the stakes always as high. But teachers, too, carry little cemeteries of regret throughout their careers. Many of us can recall a teacher who turned us off from a certain subject in school. If it weren’t for my seventh-grade algebra teacher, I don’t think I would have said to myself, Math isn’t for me all of those years. Or those slights, small and big, that stick in spite of decades between the incidents and the present day — I recall once being threatened with having the taste slapped out of my mouth because my art teacher thought I was rolling my eyes. Or the indifference in my precalculus teacher’s eyes as I admitted I was scared of failing her class and getting my college admission revoked. How many students have I made swear that writing wasn’t for them? Or certain works of literature? Or those who look back upon their experiences in my classroom with anger or irritation or boredom? So, in writing this, I am more or less laying out why it’s so important to get things right: lifelong teaching for me is a constant quest for credibility and authenticity. In order to create good learning experiences, I need to be credible and be authentic. As with surgeons, though, you can’t save them all, but you should try to do it right, nonetheless. Currently, I teach tenth and eleventh grade English at Coronado High School. When I came to Coronado, one of the books on the reading list was Tim O’Brien’s The Things They Carried, a novel about the Vietnam War told through vignettes. Cool deal, I thought. It’s about Vietnam. I’m Vietnamese. Mission accomplished. I wanted the unit to be a reflection about war, its role in the novel, its role today. I even wrote a very self-serious letter home to parents about the mature content in the novel. Sunzi called the art of war (or more directly, “military methods”) a matter of “vital importance to the state.” For Clausewitz, war was a “rational instrument for the attainment of rational ends.” For Private Bartle in Kevin C. Powers’s poem, “war is just us/ making little pieces of metal/ pass through each other.” In my teaching units, I try to have some sort of cohesive theme or idea about a topic, but in this unit, the cohesion escapes me. My friend and mentor, Peter Cook, has a basic principle for his students: Know the details. But the confusing and confounding ways we’ve talked about war as a culture in the past 14 years hasn’t made knowing the details any easier. In the fantasy novel The Buried Giant, a she-dragon named Querig releases a mist over post-Roman occupation Britain. The mist clouds the inhabitants’ memories; lovers struggle to remember the specificities of their quarrels, tribes hazily recall unsettled old scores. They grasp at the meaning of their memories but are able only to draw vague ideas. Since 9/11, it seems like we have been living in this mist when it comes to the topic of war. Wait, who are the Taliban again? Are they the same as the mujahideen? Didn’t Rumsfeld meet with Saddam back in the day? Is it Khamenei or Khomeini? There were weapons of mass destruction in Iraq, right? I think I saw Colin Powell hold a vial of anthrax on TV. One of the first things we learned as teachers is to understand the context of where you teach. What are the demographics? What are the people’s hopes? Their challenges? I learned early on, teaching without properly understanding the teaching community carries great risks. “Walking with Buddha, wear saffron robes. Walking with ghosts, wear mourning rags.” This was what my father-in-law told me after I went home one day to find it burglarized. The thieves had taken everything of value in the house, and my wife and I reeled at the invasion and loss of privacy and property. When my wife’s dad said that line, he meant to say that life is about adjustment. You can’t change your walking companions, but you can change your garb to receive them properly. Walking with Buddha is obviously instructive in its own right. In Buddhism, hungry ghosts have bloated bellies and tiny mouths, the Tantaluses of the dharmic tradition. Even so, they have things to teach us, if we’re receptive. This brings to my mind another reason why I have to get this unit right: it’s about the community in which I work. I started student-teaching in 2007 while enrolled in UCLA’s Teacher Education Program. I was 22, and like my classmates, I wanted to be an agent of change through the education system, which I saw and still see as something that perpetuated cycles of poverty and lack of access. I was assigned to Leuzinger High School in Lawndale, an area in South L.A., and would go on to teach four more years in similar schools. Leuzinger then was a school that had probably seen better days since it was the site of the summer Olympics in 1932. Colloquially, I’ve heard it called “Lose-a-finger High School” because a teacher had a finger lopped off when a student angrily shut a door on it. Located on Rosecrans Avenue, it was literally across the tracks from the more-affluent Manhattan Beach. The first day of student-teaching, I pulled into the staff parking lot and saw several police vehicles. A police officer in front of me was running into campus with a shotgun that I learned later was a beanbag launcher, and overhead was the unmistakable fwhup-fwhup-fwhup of that ghetto-bird helicopter. There looked to be a fight of some sort between the African-American students and the Latino students. Fists flew, insults hurled, people got caught in the middle. Some teachers tried to corral their unwilling students indoors. My lesson that day was supposed to be on Romeo and Juliet. The scene to me looked like one pulled from those teacher movies they make every few years. The premise is always the same: a good-hearted rookie educator from outside the ghetto enters what seems to be a war zone of a neighborhood. They are shocked by the desperation of their students’ lives. They fight the cynical taught-for-too-long, union-protected veteran teachers over their deficit views on the students (“These kids need hope, and a chance in the world!”). After a few awkward lessons using culturally relevant things such as rap (“You see, Shakespeare was Drake and Ben Jonson was Meek Mill; this here is a diss track!”) and therapeutic literacy, they are able to transform these kids into people who told their own stories and had agency in their own lives. I presented to you that scene partly because it’s what people want to hear about most when I tell them I used to teach in the economic inverse of Coronado. I also presented to you that scene because its firm imprint in my mind revealed my ignorance on that day. The day following the incident with the helicopter and Officer Beanbag, I tried to have what I then called a “community dialogue.” “Guys,” I intoned pleadingly, referring to the fights from the day before, “we need to come together. If people like the KKK saw what happened yesterday, they’d be saying, ‘Mission accomplished.’ How can we rise up if we keep kicking each other down?” In my mind the music swelled and the cameras panned around the room. Maybe a tear of recognition from a student or a scowl from an administrator leaning on the doorjamb. Played by Paul Giamatti, he would begrudgingly purse his lips in admiration. And they would get a hapa actor to play me: Asian-looking, but not too in-your-face Asian, y’know? I had good intentions, but I had failed to understand the context of this community. I didn’t know the details. No credibility, no authenticity. Here’s the TL;DR. South L.A. used to have a decent economic base and people were able to find jobs. When many of the factories closed up shop and left town, a lot of people lost those jobs. Add to the mix decades of redlining, problematic policing, and a drug epidemic. Add to that an influx of immigrants who also wanted a piece of the American Dream in a place with already few economic opportunities. Add to that the lack of funding and resources stemming from No Child Left Behind. Add to that high teacher-turnover rates and a discipline policy focused on enforcement over counseling. The stories not told: veteran teachers who taught for decades in that school with the energy of a first-year teacher; the teachers who collaborated to create safe spaces for all kinds of students. The kids who went on to college to have stable middle-class lives, who made it despite not having a record contract or an NBA career like their fellow alumnus Russell Westbrook. All these stories tell much more than a Hollywood product could in two hours, but we as a culture do not have the time or the patience for complex stories. In that classroom, I had no credibility because I failed to understand the conflicts that challenged that school. For me, increasing awareness and some intellectual exercises were supposed to be enough to overcome the systems and cycles that challenged this community. What does this have to do with war? In both areas, the key to having any credibility is clearly understanding and assessing the conflict at hand. Who are the parties? What do they want? What are the underlying causes for their actions? But for the past 14 years or so, it has become harder and harder to separate history from political narrative, which are sometimes not the same things. History tries to tell a story about why things happened; political narratives tell a story in order to justify what happened. Here’s another story. It was 11/11/11, Veterans Day. It was my first year teaching at Coronado High School, where I learned there was a sizable military population. I was meeting up with a friend at a restaurant. While I sat waiting for a table, a young sailor came in with some of his buddies. Looked to be about 22 years old, clean-shaven. Rocked the blue digicamo. They took off their hats as they waited for their table. Considering the date and considering that I’ve always wanted to do it, my mind weighed the option of walking up to them and saying, “Thank you for your service.” Maybe firm handshakes all around, offer to buy a quick round of drinks or something. While I played this out in my head, they did their thing together, chatting and talking shop. Before I could make up my mind, they were gone: ushered by a server to their table. I’m sure many of you have done that simple act; after all, expressing gratitude to the military is pretty easy. So, why not me and why not there? I realized later that “Thank you for service” was not about them. It was about me. I wanted to feel good, to feel patriotic. I wanted to imagine myself doing this nice thing walking away feeling good about myself. They would have to go back to their lives doing what they do, and I would go back home and play Skyrim on my PS3, which was released that day. I wanted to thank them, but I didn’t even know what I was thanking them for. It was like one of those things you say in Mass because you’ve been saying it since you were a kid, but the real meaning of it escapes you. My “Thank you for your service” would have been an empty one, and until I had a better understanding of what those servicemen go through, I would just be parroting a feel-good phrase. But the past few years have changed that. I’ve learned some more things about kids from military families, formed some understanding of what they’ve been through. And while I can never know the full experience, at least now my “Thank you for your service” would at least be more credible than the one I had in mind four years ago. All educators know that, when dealing with a student, a teacher deals with her or his family context in varying degrees. It’s a profession that not only requires content and pedagogical knowledge, but some awareness and sensitivity to a child’s home environment. I’ve had the fortune to experience many family configurations that made me more empathetic as a person: children of undocumented immigrants, children who live out of hotel rooms, children who live with grandparents, children whose parents live in another country. Add to this children from military families. I don’t pretend to have some sort of universal theory on military families, but the small snippets I’ve experienced have been enlightening. One of the first things I noticed about some of these kids is their wait-and-see attitude about people they meet. Some students you connect to pretty easily and validate your ability to connect. Some teachers, like myself, have a rather needy weakness: connecting to our students personally is one of our first priorities. But military kids don’t always connect to you right away. They sometimes engage but keep a guardedness about them sometimes. I used to think this was something personal, but I realize that maybe moving a bunch of times in your life might do that to you. I once had a sophomore, whom I’ll call Carl, who had moved 13 times. His father was a naval officer, and he had been all over the country and overseas. Carl told me that he was a wrestler, and you could tell by his walk: legs slightly bowed, head cocked, hands set in a permanent Greco-Roman stance. The kid walked like he was wrestling the whole world. He excelled in class, too, giving all of his effort regardless of assignment: from the smallest busywork to the major unit essays, he tackled every task like his life depended on it. And I got a sense that this control was very important to him: he spoke in measured tones, his prose was always considered and lacked that thesaurus abuse with which kids tend to write. I remember we were working on an essay and he had time in class to develop his ideas. Carl raised his hand for help and we were working out the wording of a sentence that just didn’t seem to stick. He revised it constantly and neither of us found any satisfaction. And then, as if some invisible string had been cut, he burst into tears. I’m used to tears from students; most of the time you see it coming a mile away. Downcast eyes, a swelling of the face, a tightening of the throat before a tearful declaration of truth: I’m struggling in this class; I’m not getting along with my dad; The pressures I face are too much. But this one surprised me. This kid who had the maturity and discipline of a soldier was not crying, but weeping. All around him kids typed away on their laptops unaware or respectful of the situation their classmate was in. I gave him a break and later on we talked. His dog had died. Now, I understand that of course a dead pet is a reason for tears, but what this dog represented to him, I wager, was also important. This dog had been with the family through their moves across the country, and it was one of the few symbols of stability in his life. And it’s these little things I learn about military families that makes me grateful for them. Every family has its own way of creating stability. A girl in my class wears her dad’s shirts from time to time when he’s deployed. Another student welled up in class when discussing the difficulty of not being able to know where her dad is, and what he’s doing, and whether he’s safe. But it’s not all sweet Hallmark moments. Remember that military families are made up of human beings, and human beings are complicated. Some kids struggle in single-parent households. Some kids say that sometimes there’s an adjustment period for when Dad or Mom comes home from deployment. As a household they had developed rhythms and cycles without this person, now they have to find a way to weave him or her back into their lives. We have the saying, “Absence makes the heart grow fonder,” but in my family, the saying is, “Distant bodies, distant hearts.” My dad was imprisoned by the Communists when my sister was a toddler, and by the time he came back she told my mom she didn’t like this new dad, who was constantly cursing and angry. In Coronado, I’ve heard about sailors who grow used to the ordered, scheduled way things work when they are on ships, and the challenge they and their families face to help them adjust to the sometimes disorderly way that the civilian world operates. When you’re a kid and your dad is superhuman, appreciating him was a matter of fact, but it’s hardly challenging or realistic. I didn’t truly appreciate my parents until my 20s, after I got to know them as human beings. And as human beings, they sometimes made mistakes or had complicated motivations. At the heart of it I appreciate them nonetheless. And this has been my most important lesson in my education at Coronado High School — authentic apprecation for something occurs after you are able to see its imperfections and little cracks. I am grateful for military families not because they are perfection embodied; I’m grateful for them because they are so human like us and they bear an extra burden on top of that. What’s more, I have never seen a military spouse dramatize her or his sacrifices, or complain about how hard it all is sometimes. Someday I hope to be someone who does good work without making a fuss of it all. But getting an understanding of how military families work in my context only helps me part of the way. The other challenge is coming to terms with my ability to talk about war. People sometimes assume that because I am Vietnamese, I have some particular insight on war that can be illuminating in new ways. While the post-war chaos of Vietnam has directly affected my family, my actual understanding of the war itself has been shaped largely by my American upbringing. Sure, I knew little things as a kid, but nothing substantial. My neighbor, for example,used to be Viet Cong during the war; I was taught to hate Uncle Ho, and so once I kicked his portrait off a table during a doctor’s visit. When I visited the former palace of Ngo Dinh Diem in Saigon, now a tourist destination, I took a picture of myself flipping off the tank that crashed through the gates. My dad proudly slipped it inside our family vacation album. 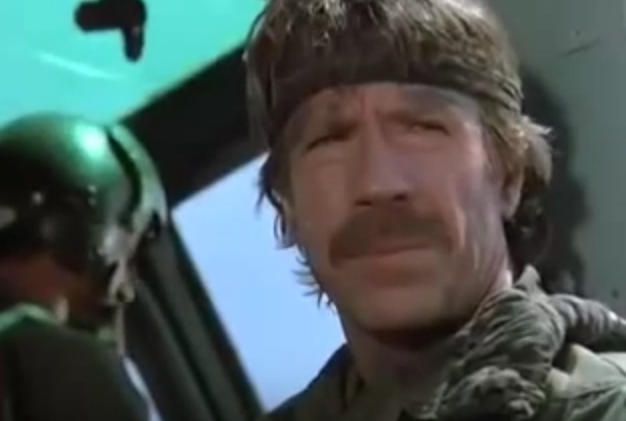 Here’s the truth: Chuck Norris’s Missing in Action was one of my first educational experiences about the Vietnam War. My dad and I had a tradition of going to a video rental place Called Apple Video 2 every week and picking out VHS tapes for his days off. We usually had one action movie for the boys and one romantic comedy for the girls. It was 1992 when we began our love affair with cheesy action movies from the ’80s: Bloodsport, American Ninja, Iron Eagle, and, yes, Braddock: Missing in Action I, II, and III. America was mad as hell that we lost ’Nam, so we sent back Chuck Norris and his beard to karate-kick the shame away. My dad and I loved those movies, and we pumped our fists whenever Norris’s righteous spin kick knocked out a VC or whenever he would frag the hell out of a crowd of black pajamas and sandals. So what if the VC spoke broken Vietnamese and were probably Cambodian. So what if the big narrative was pretty much Madame Butterfly and Miss Saigon with AKs and flamethrowers. Braddock gave my dad a brief escape from the feeling of political injustice that comes from losing your country. For a ’90s kid like myself, it was these movies and games like Metal Gear Solid (“Snake, we are not the tools of the government, or anyone!” sounded hella deep at the time). The generation after me? I would bet it’s Call of Duty and American Sniper, Reddit conspiracy theories and ISIS beheading videos. And this is where I’m supposed to come up with some grand scheme to tie it all together, but it isn’t. I don’t know what to do about the ways the media we consume as a younger generation have warped our views on war. The Boomers seemed like they had real stuff go down, stuff that happened to their friends and peers that divided them into pro-war and anti-war camps. But the Millennials and those after us? We are the generation of Loose Change and “freedom fries,” of embedded reporters and bomb-bomb-bomb, bomb-bomb Iran to the tune of “Barbara Ann,” of never being sure if we’re at war or not. Every generation seemed like it had its wartime theme. The Civil War was “Dear Mother: Humanity is terrible. Cue ‘Ashokan Farewell.’” WWI, “War + technology = Lost Generation.” WWII, “The Good Guys Win.” But what’s our theme?